It has been a long time since I posted here. I have not been idle by any means, just “otherwise occupied”. No long excuses, just time to resume and catch up. Today I am featuring a portrait I have painted and stitched of my 28 year old Dusky Conure Daphne. Daphne began her life with us as a birthday present for our then 10 year old daughter Courtney. I hand fed her, have been her caretaker, and she has been my buddy ever since; out-living all our other pets. She is opinionated, bossy, and hostile to those not willing be a true friend (meaning she bites first). She keeps “young” and active playing with her toys and shredding cardboard cereal boxes. My inspiration photo was one of a few taken by my photographer daughter Stephanie ( http://sdkphoto.com/ ) of Daphne. 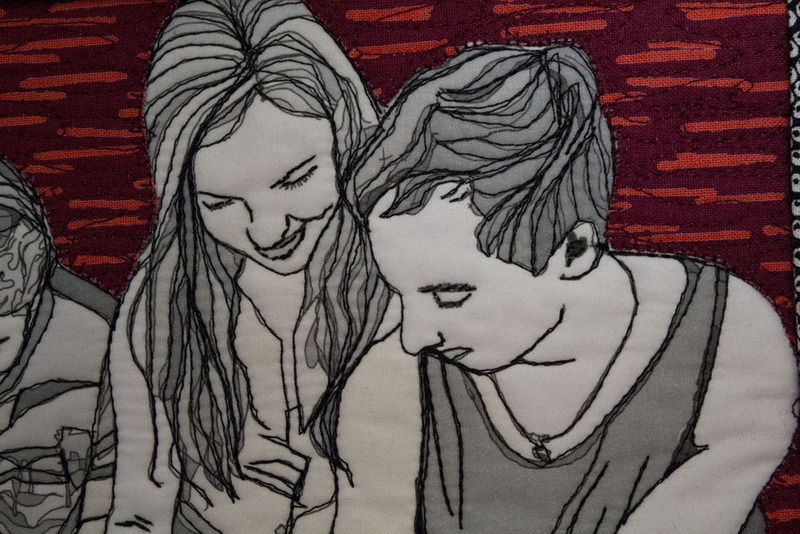 I began the portrait in class with fiber artist and friend Lura Schwartz Smith–a very inspirational teacher ( http://lura-art.com/ ). Working with inks and colored pencils on whole printed background fabric, her portrait came to life. 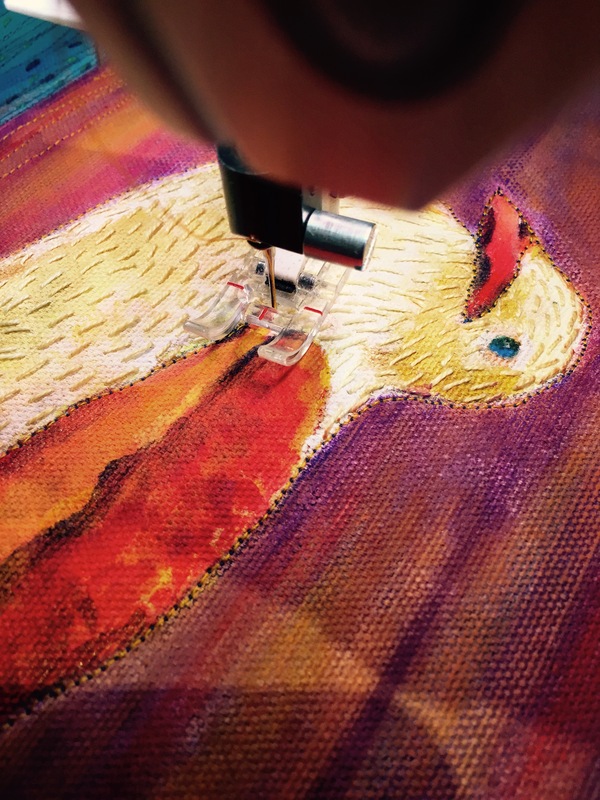 I machine and hand stitched her feathers and my hand. 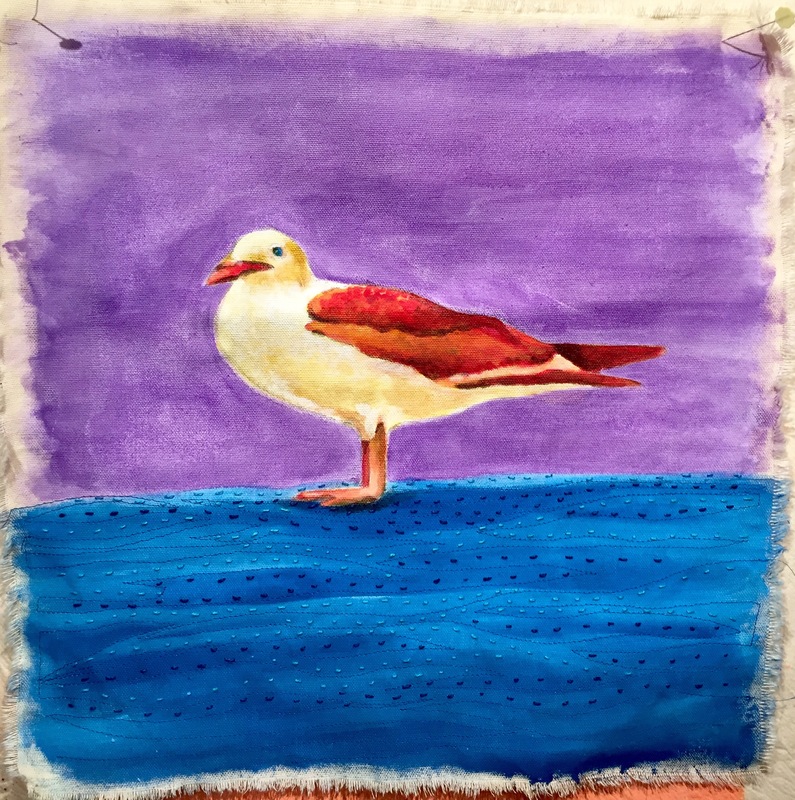 A lone hungry seagull watching me eat lunch at the Malibu Pier was my inspiration for my SAQA (Studio Art Quilt Associates) 2015 Auction Donation. 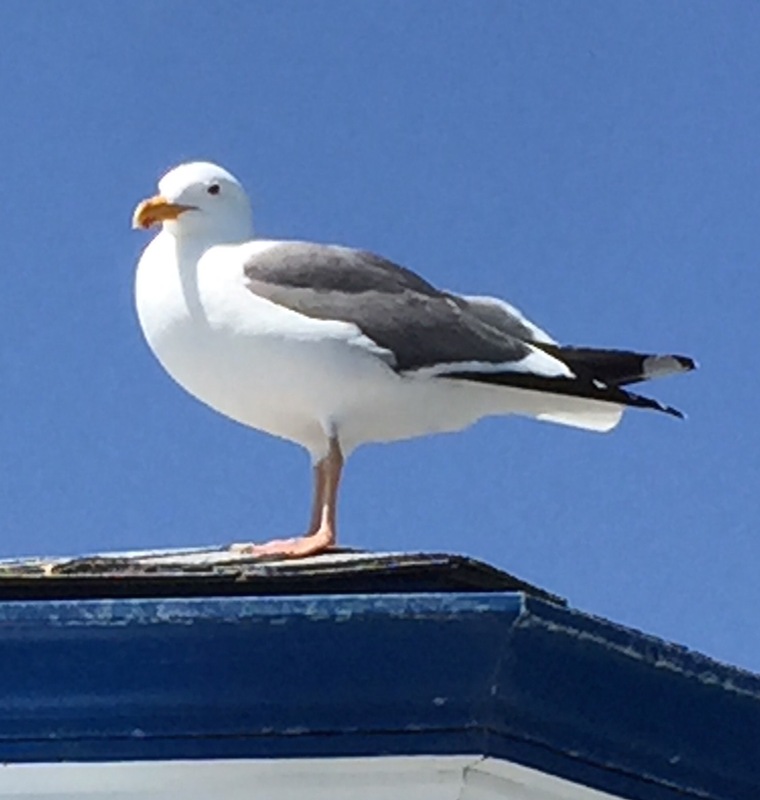 Watching every bite I took…I had to take his photo. Pencil drawing first followed by paint. Sky and water colors applied with airbrush paint. 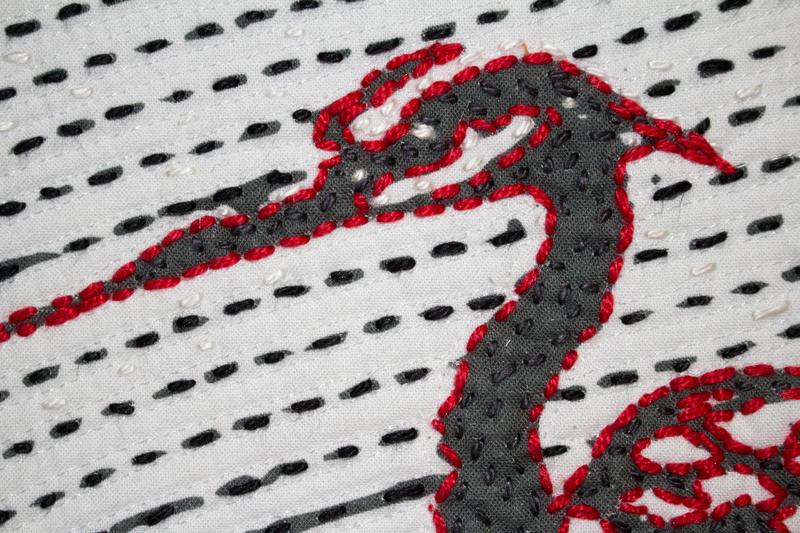 Hand stitching with pearl cotton on water. 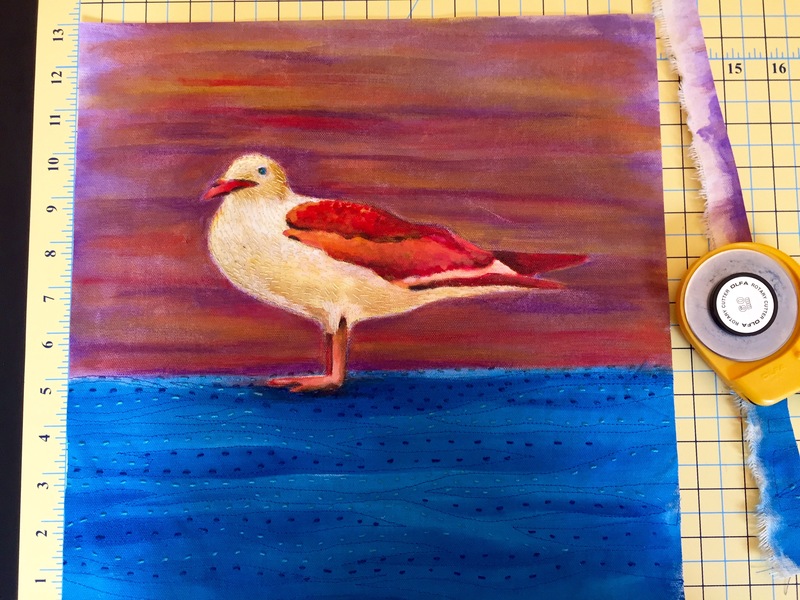 Sunset colors added with water-soluble crayons. Feathers hand stitched on body with pearl cotton. Edges cut and squared off, quilt sandwich made (top, batting, backing). 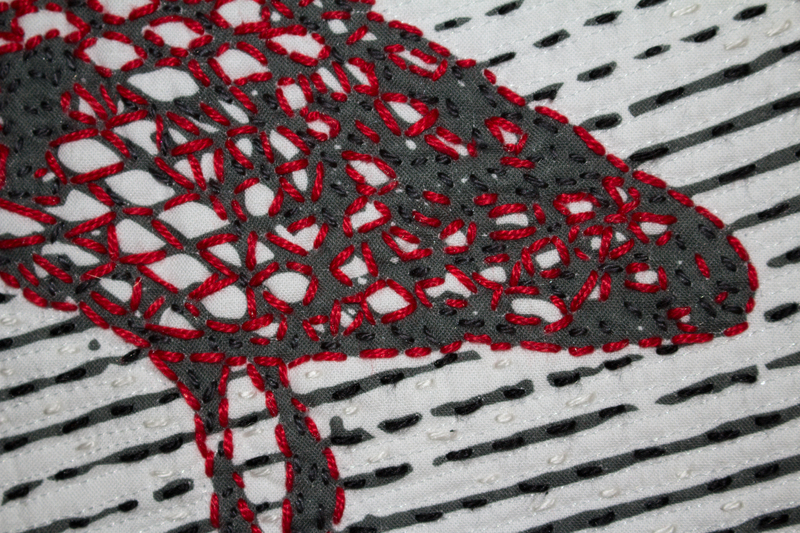 Machine quilting of quilt sandwich. 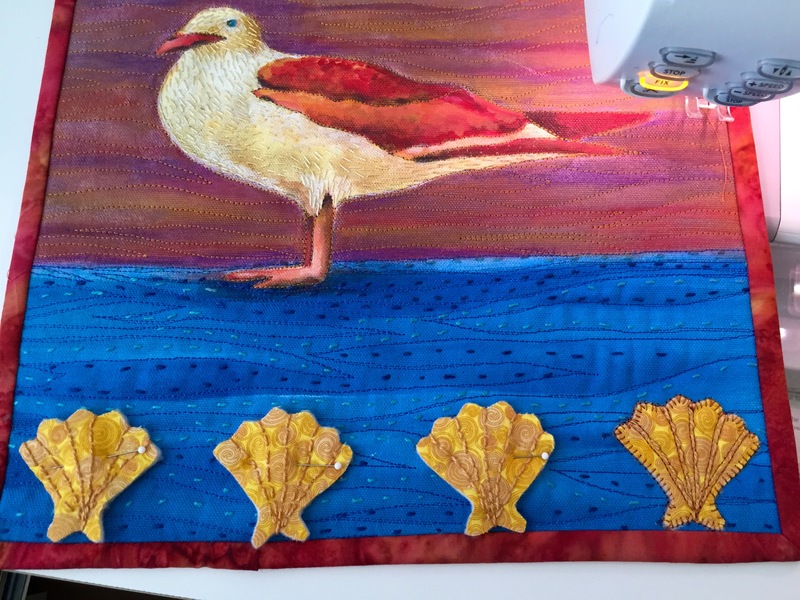 Scallop shells added to bottom border. Individually batted and hand stitched. This year’s online auction begins September 18th. 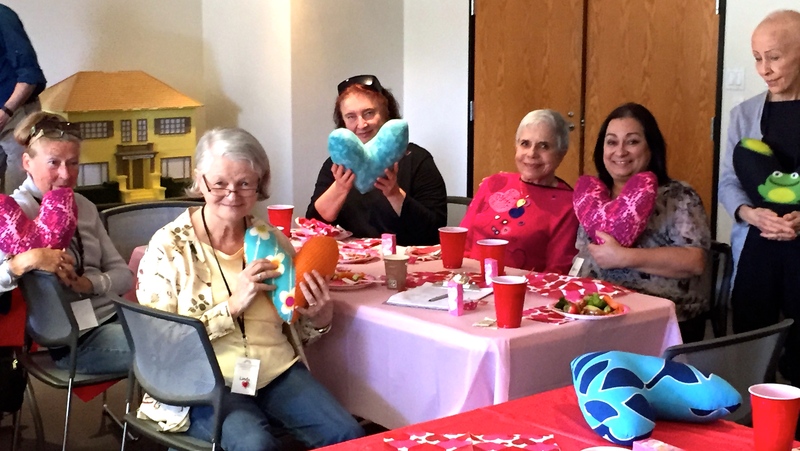 Happy faces as I delivered 76 heart pillows to the Cancer Support Community/Benjamin Center while they were celebrating a Valentine’s Day lunch. 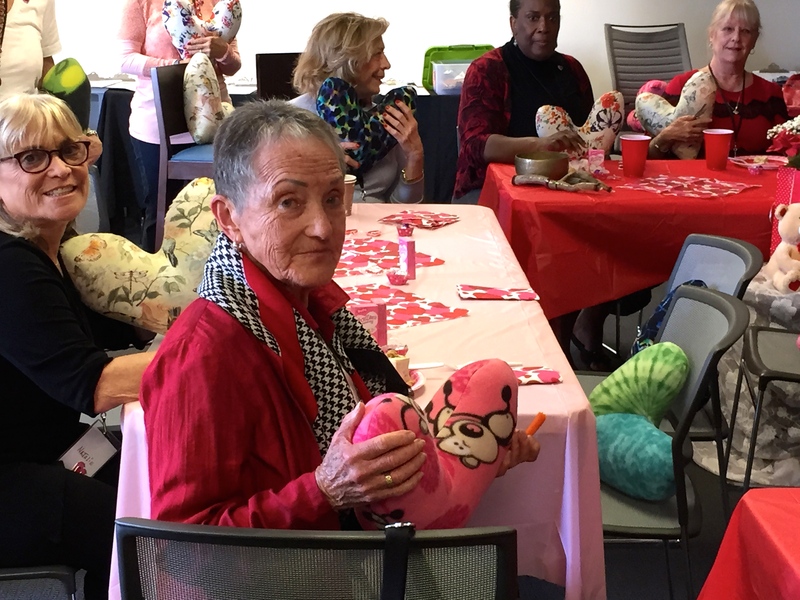 Eight friends and I gathered earlier in the week for a workshop to cut, stitch, sew and stuff heart pillows that aids breast cancer patients. The pressure of the pillow when placed under an arm helps in recovery….plus it provides a “self hug”….and who doesn’t enjoy a hug when you are healing? The nine of us call ourselves Las Fortunas. We like to find projects where we can work together to help others in need. 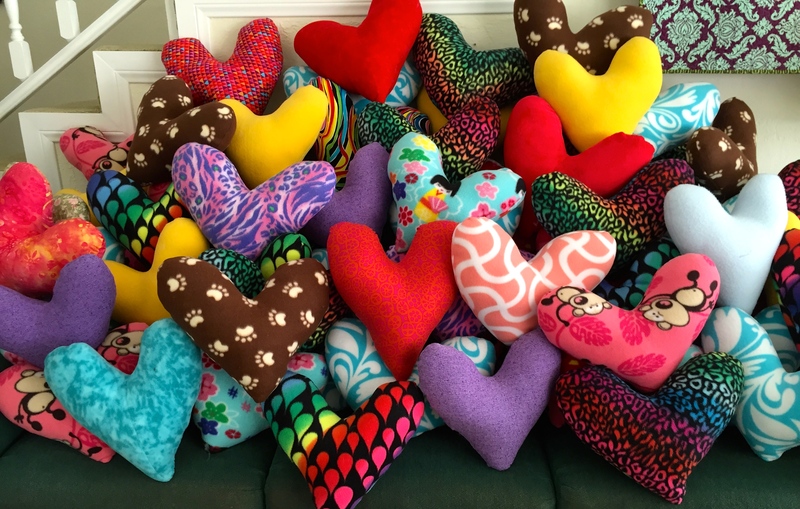 In the past two years we have focused our efforts on making the heart pillows. We have donated almost 400 pillows. 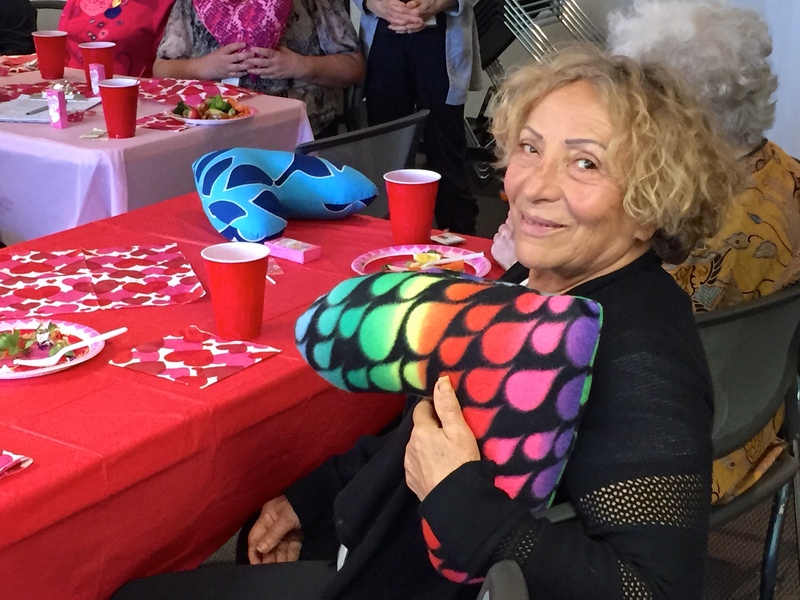 The Cancer Support Community/Benjamin Center in West Los Angeles is a remarkable place offering free services to all cancer patients (all kinds) and their families. We are very pleased to support them. 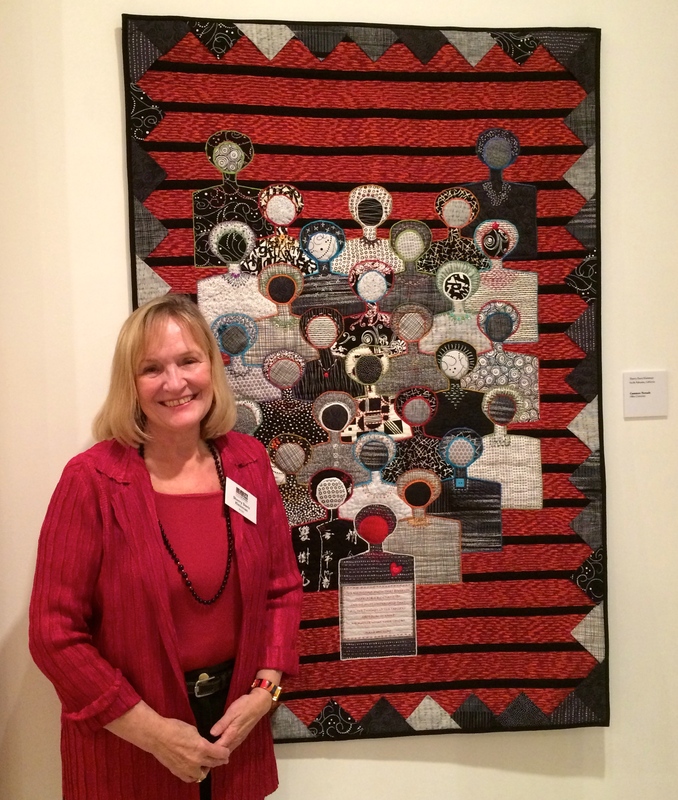 “The 100” Fundraiser to Fight Cancer/Fiberart for a Cause–My Donation! I have just finished creating my donation for The “100” Fundraiser to Fight Cancer! My inspiration was a photo I took at the Huntington Gardens in Pasadena, California. 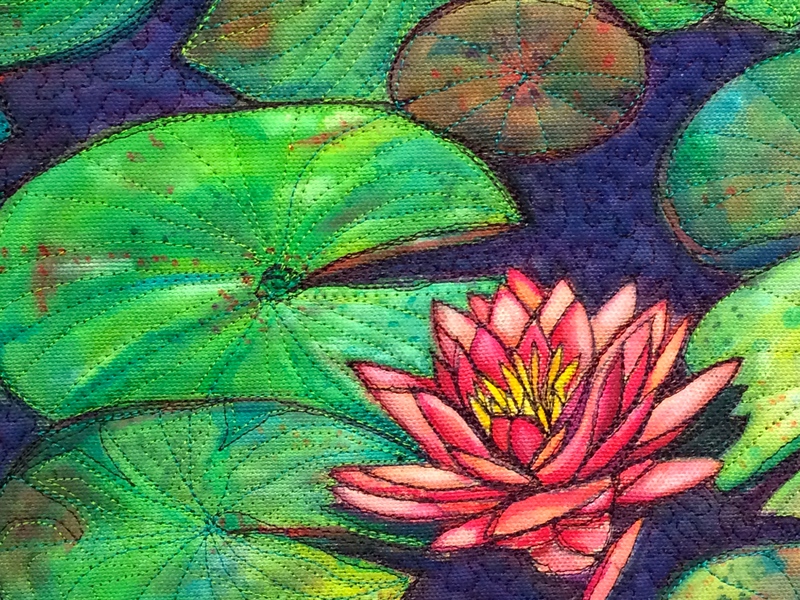 I am calling it Lily Pond. I painted it with water soluble crayons on canvas. 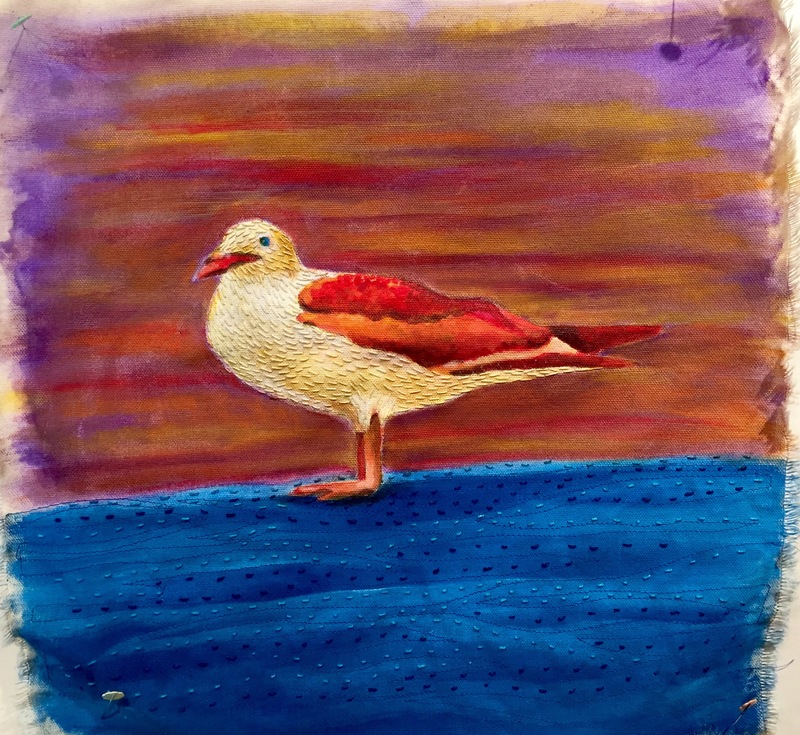 It is machine stitched and It is 13 w X 11 h.
I’m sure you will want to be one of the very exclusive 100 patrons who will be randomly assigned artwork from an extraordinary line-up of international fiber artists when they donate $100. 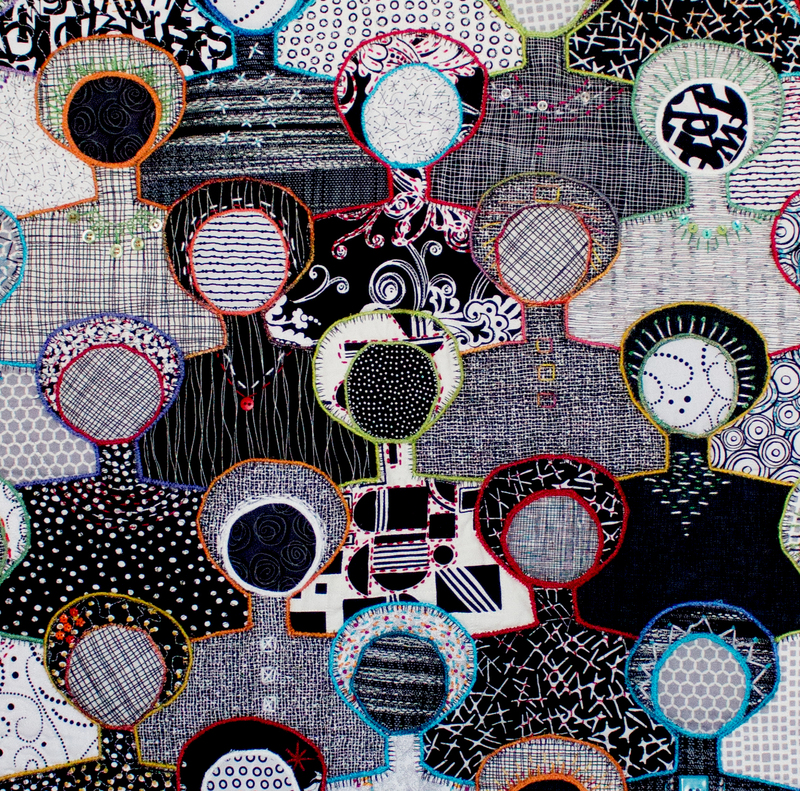 Fiberart For A Cause has already raised $240,000 through the generosity of fiber artists and patrons in recent years. 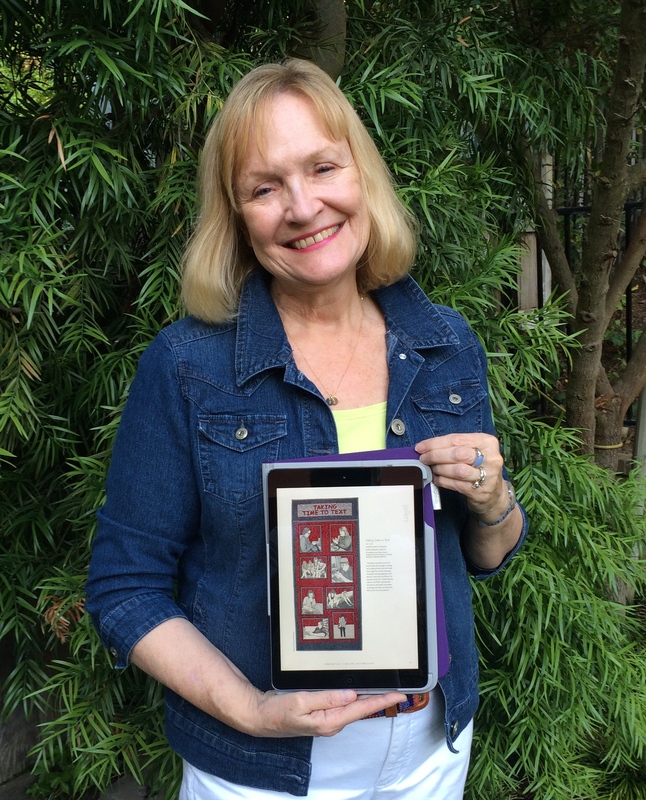 Many thanks to Virginia Spiegel for asking me to participate. 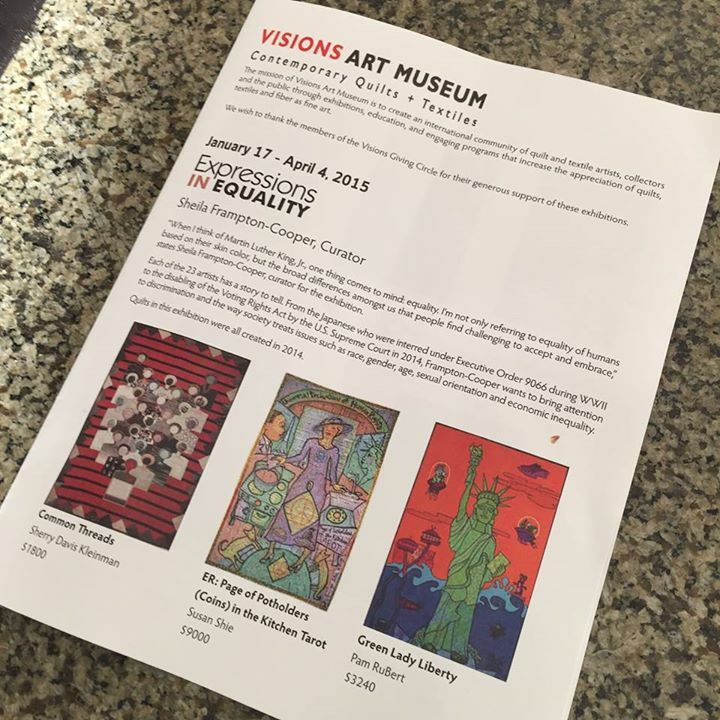 Visions Art Museum’s Saturday, January 17th’s reception of the exhibit Expressions In Equality was outstanding. 23 pieces (each different and inspiring) were on display (until April 4th). How honored I am to be part of this exhibit. 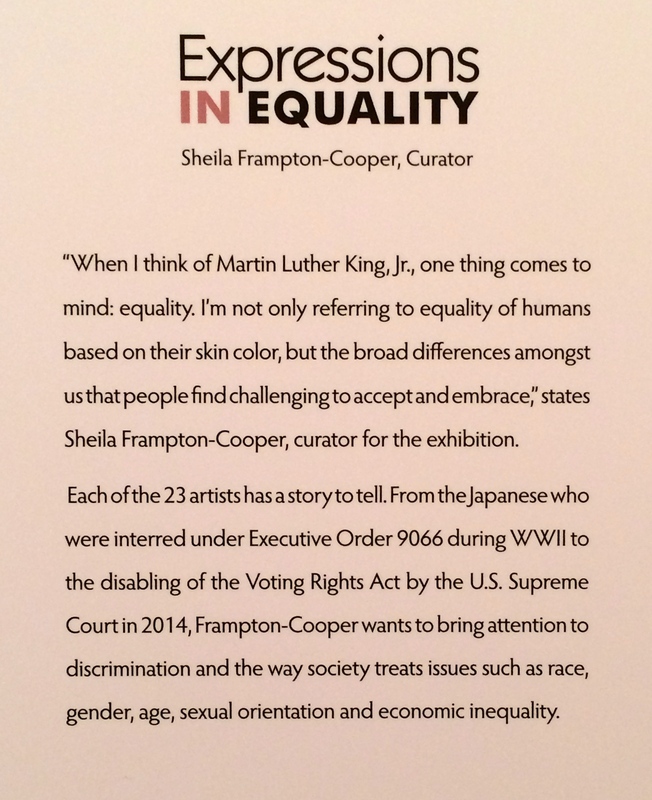 Thanks to curator Sheila Frampton Cooper for asking us all to participate. 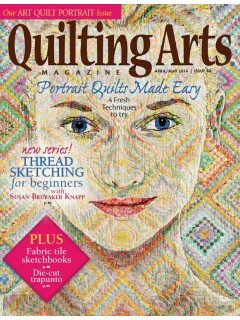 My piece is on the cover of 8 page gallery guide featuring the 23 artists in the show. Below is a link to the gallery guide shown above with photos, artist names, and prices for work in the exhibit. It is a “must see” exhibit if you can visit San Diego before April 4th, and if not this guide will be the next best substitute. 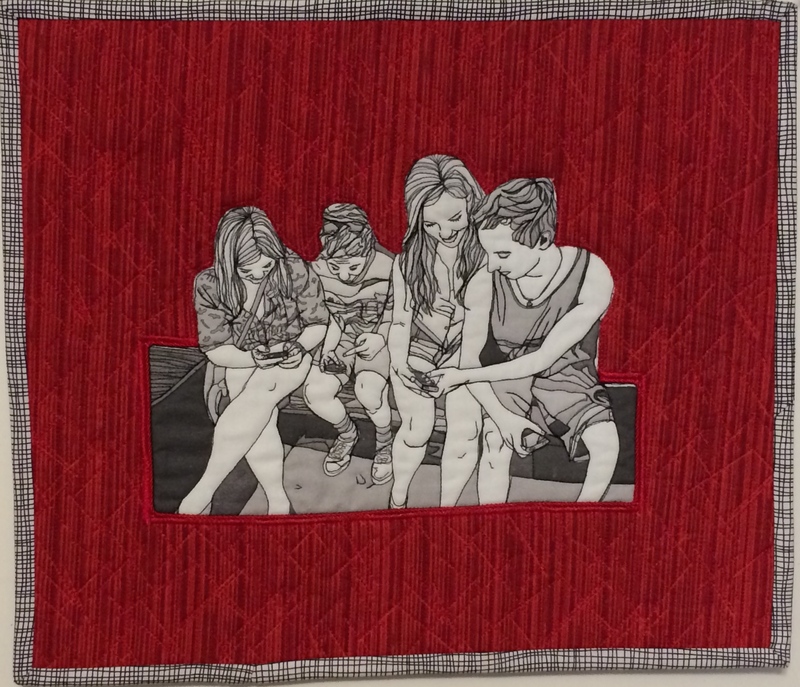 While at the International Quilt Festival in Houston I am looking forward to seeing the exhibit Reflections, Dinner@8′s 2014 exhibit curated by Jamie Fingal and Leslie Tucker Jennison. 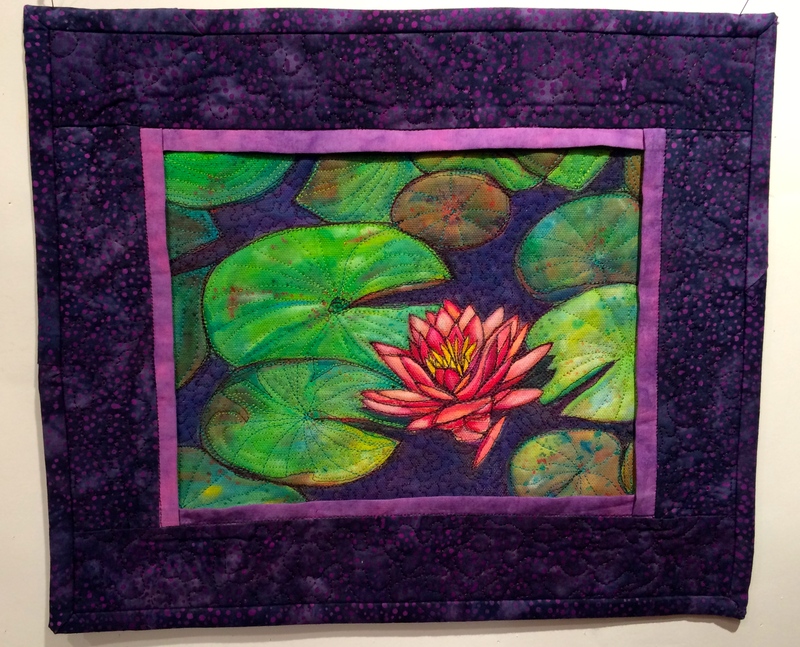 I am thrilled that my piece In Still Water is part of the exhibit. 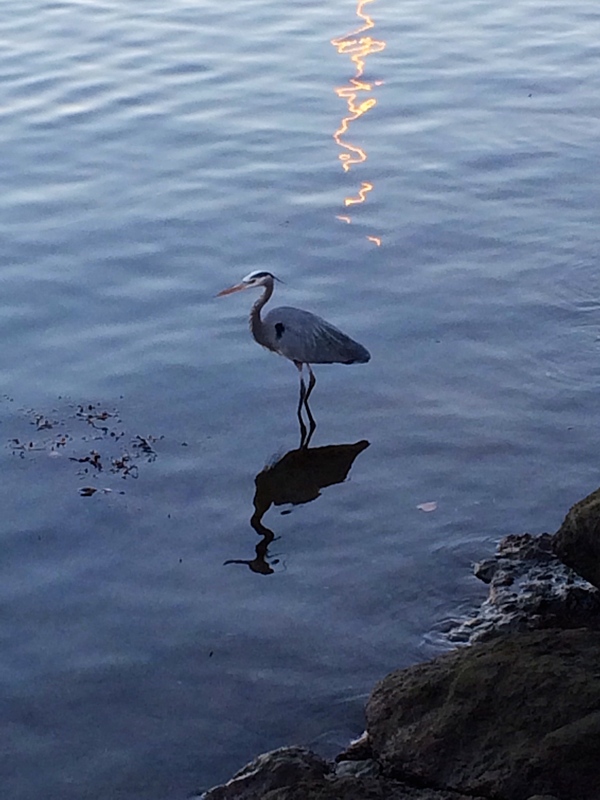 My inspiration was a photo I took while visiting Santa Barbara of a Great Blue Heron wading in a pond. 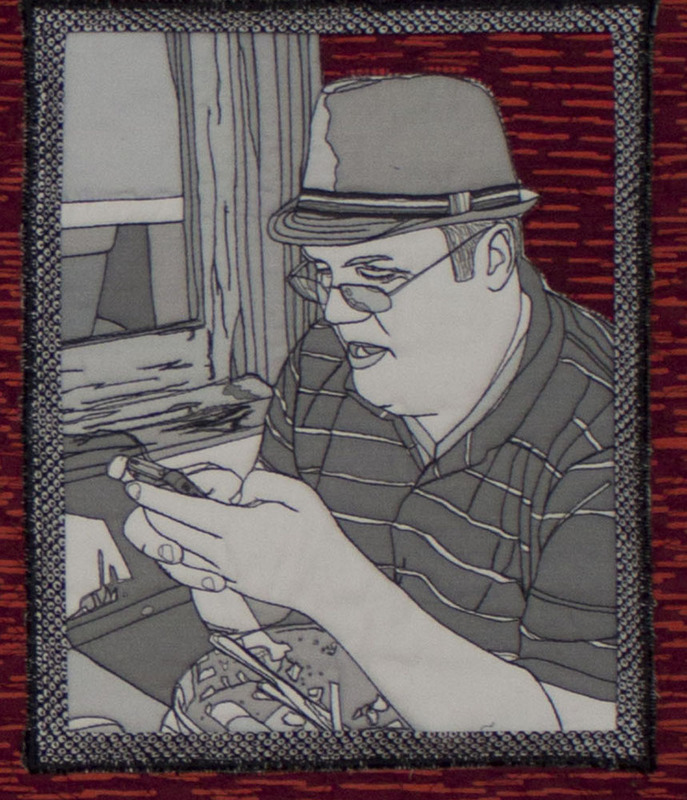 I digitally manipulated the photo with an app on my iPad so that it resembled a wood cut; I then printed it on whole cloth, adding Asian fabric letters to set the tone. 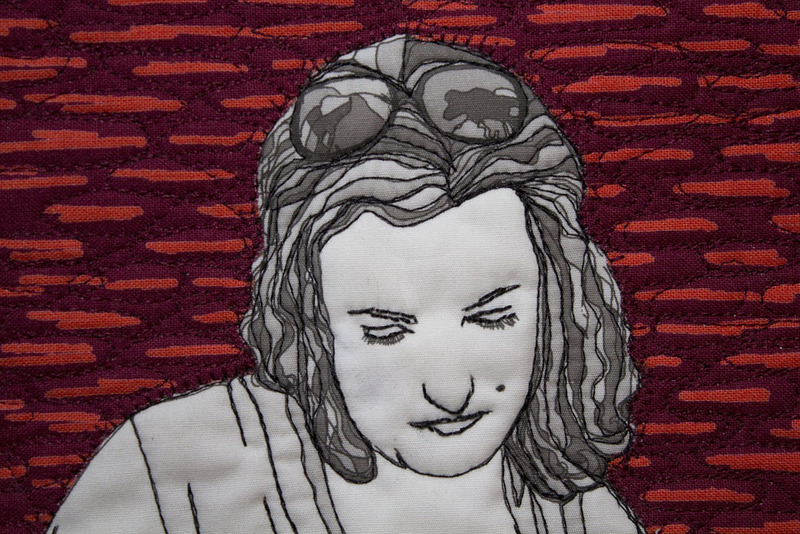 The piece is heavily stitched with both machine and hand stitching with silk threads. The stillness of the Great Blue Heron mirrored in the still water helped quiet my mind from the noise of the day around me. 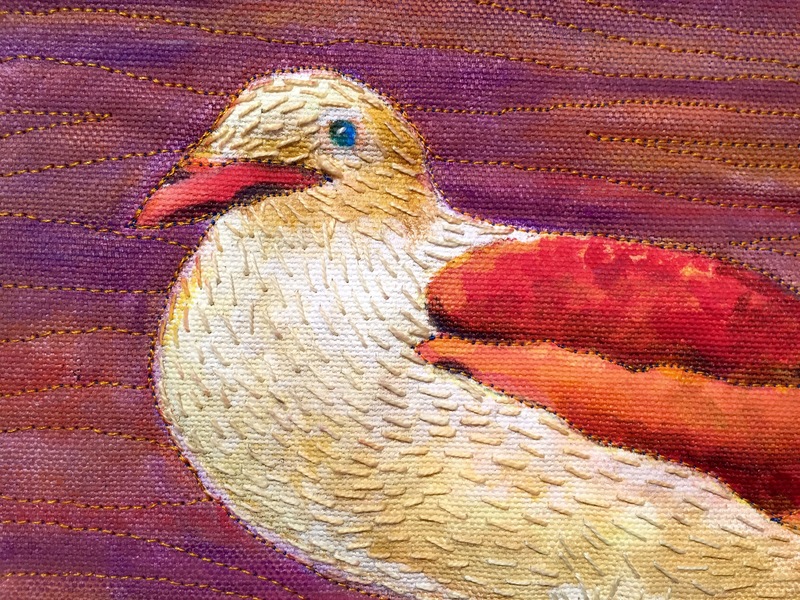 I found myself lost in thought, reflecting “what is and what could be” as I spent hours methodically hand stitching my image. What a pleasure it was to create this piece! 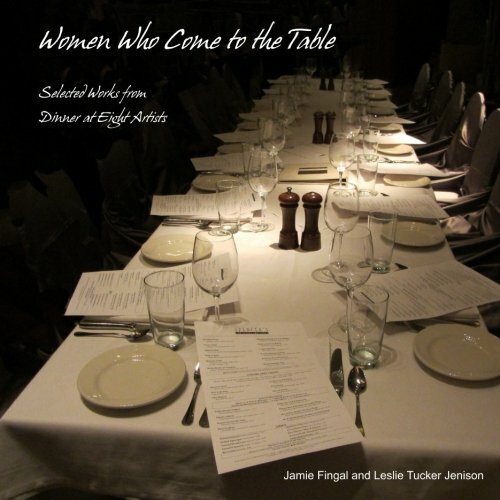 Jamie and Leslie have just published a new book called: Women Who Come to the Table: Selected Art from Dinner@8 Artists, featuring selected artists from the past 6 years of exhibits they have curated. I am thrilled that I have been part of their exhibits for the past 5 years. I look forward to joining them in Houston for a real live dinner at 8 with other artists from the exhibit (Yes that is how they named themselves!) It is available through Amazon. 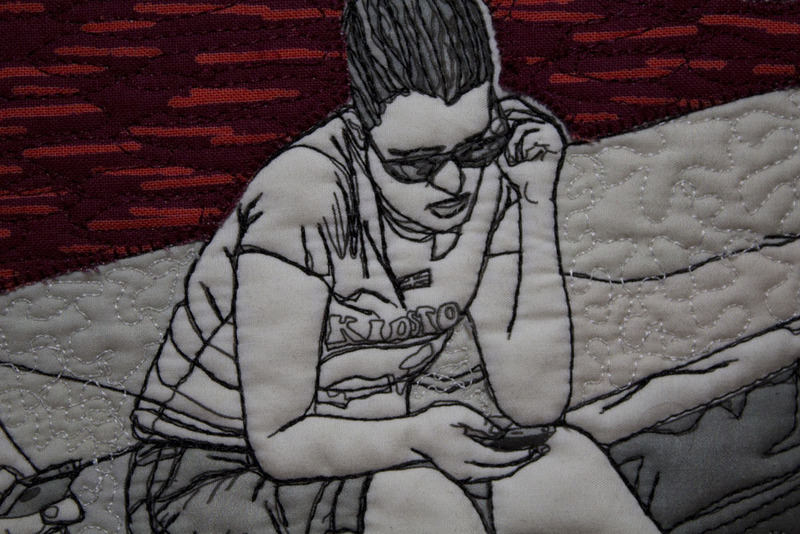 A gallery of selected works from the traveling SAQA Exhibit: Text Messages, are featured beginning on page 32. 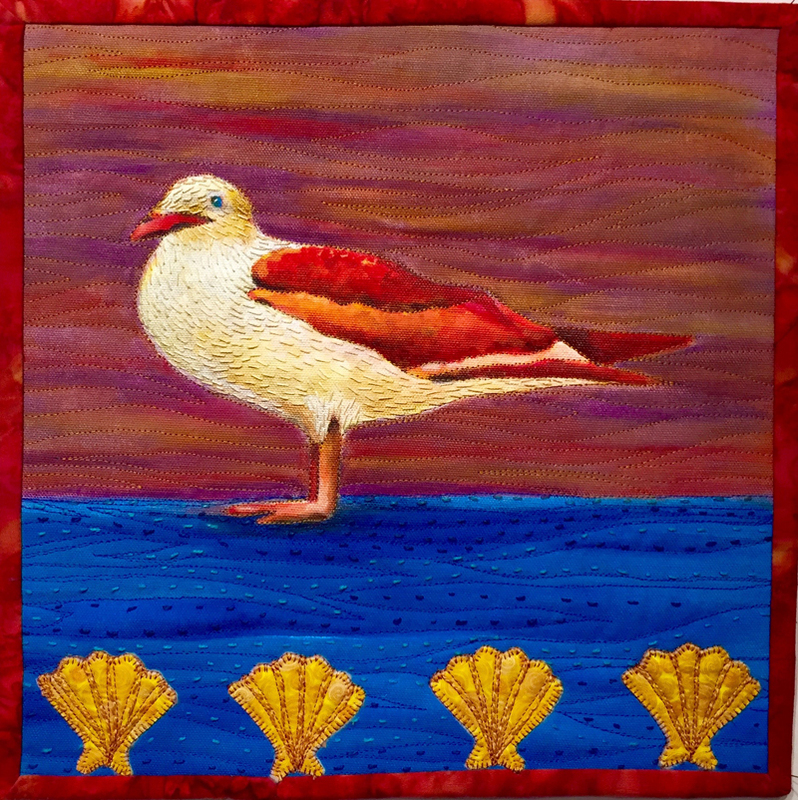 I saw the exhibit last October when it premiered at the International Quilt Festival in Houston. 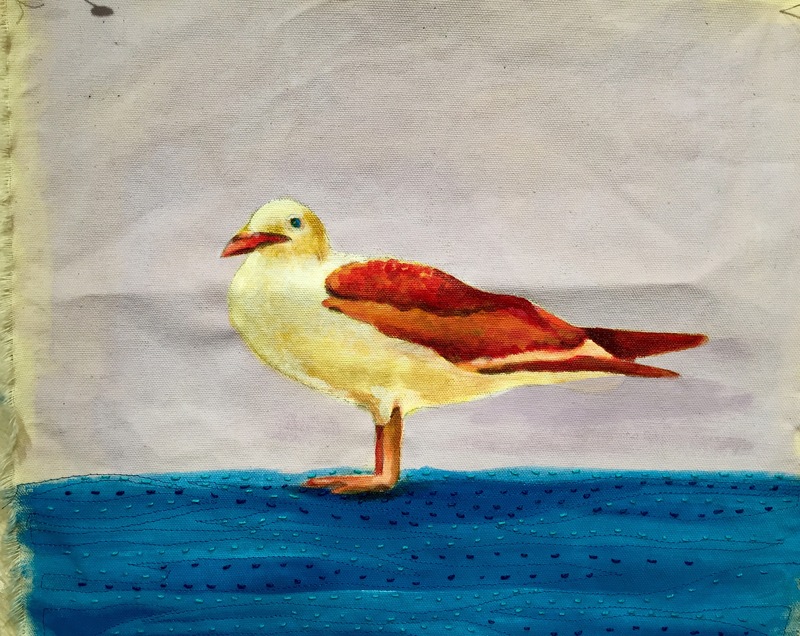 In the magazine you will see samples of the diverse pieces in the exhibit that interpret the theme. 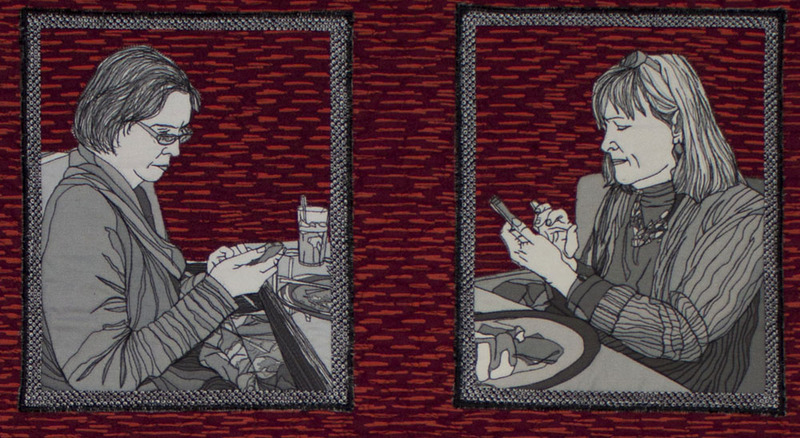 My own is pretty literal, showing people actually texting. Using my iPhone I snapped photos of family and strangers using their mobile devices. 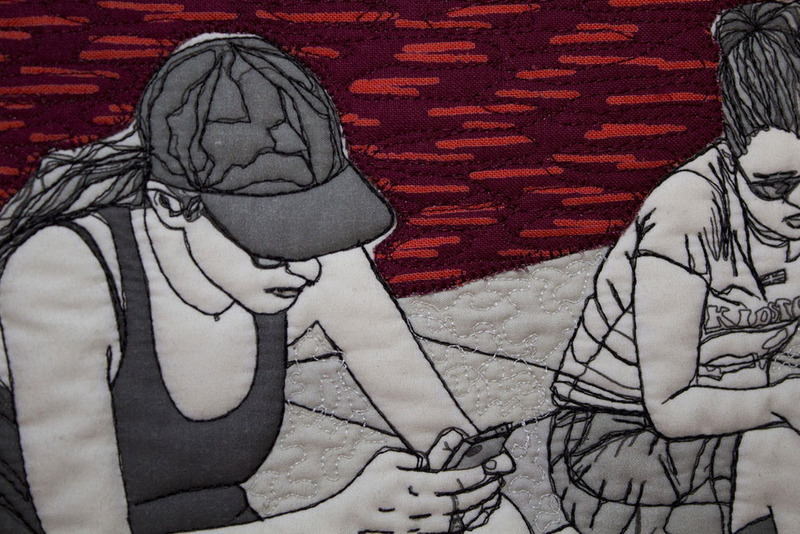 I drew images from the photos on my iPad that I then printed and stitched (by hand and machine) onto fabric to create my piece.